Start a text conversation. Tap , then enter a phone number or email address, or tap and choose a contact. An alert badge appears if a message can’t be sent. Tap the alert in a conversation to try sending the message again. Double-tap to send the message as an SMS text message. Resume a conversation. Tap the conversation in the Messages list. Use picture characters. Go to Settings > General > Keyboard > Keyboards > Add New Keyboard, then tap Emoji to make that keyboard available. When you type a message, tap to change to the Emoji keyboard. See Special input methods. See what time a message was sent or received. Drag any bubble to the left. Make a voice call or FaceTime call to the person you’re texting. Tap Contact at the top of the screen, then tap or . See a person’s contact info. Tap Contact at the top of the screen, then tap . Tap info items to perform actions, such as making a FaceTime call. See earlier messages in the conversation. Tap the status bar to scroll to the top. Tap Load Earlier Messages, if necessary. 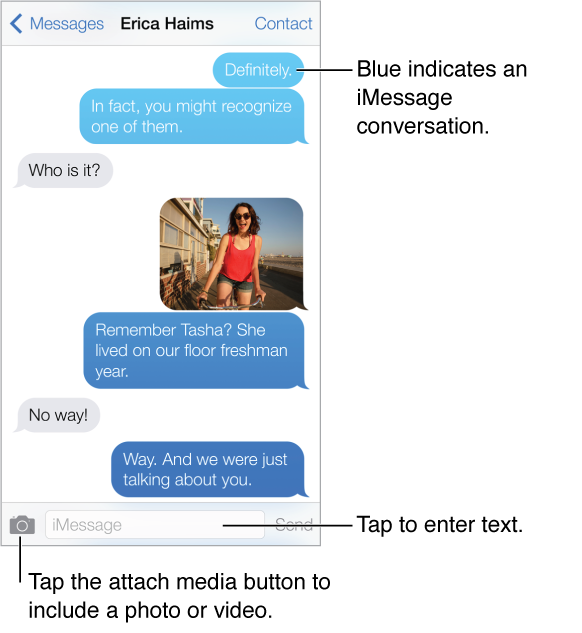 Send messages to a group (iMessage and MMS). Tap , then enter multiple recipients. With MMS, group messaging must also be turned on in Settings > Messages, and replies are sent only to you—they aren’t copied to the other people in the group. Block unwanted messages. On a contact card, tap Block this Caller. You can see someone’s contact card while viewing a message by tapping Contact, then tap . You can also block callers in Settings > Phone > Blocked. You will not receive voice calls, FaceTime calls, or text messages from blocked callers. For more information about blocking calls, see support.apple.com/kb/HT5845.